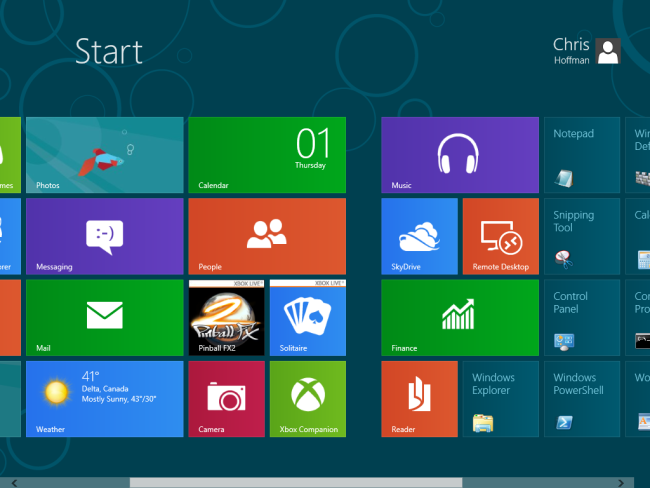 Windows 8 was clearly designed with touch screens in mind. 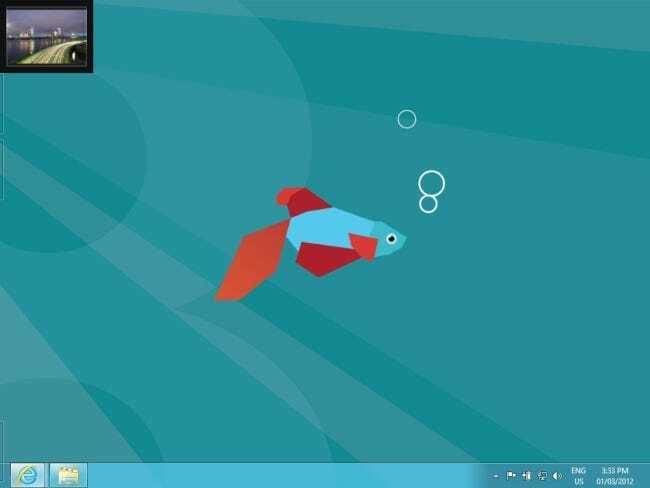 Using Windows 8 with a mouse can be disorienting at first — many of the tried-and-true Windows interface conventions have changed. 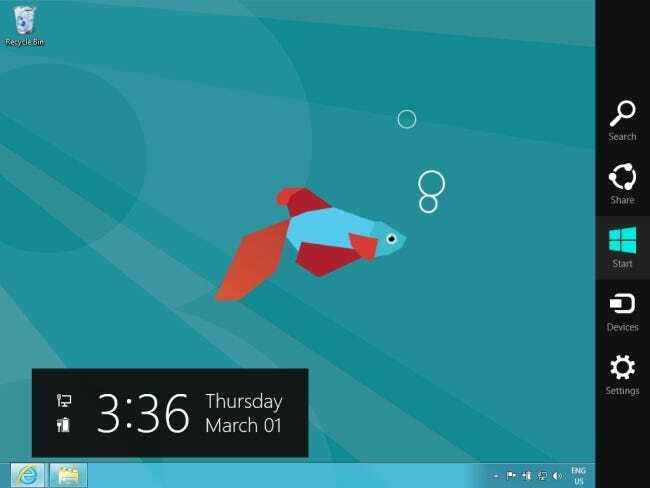 You can still get around Windows 8 and use all its features with your mouse, although it feels a bit awkward at times. 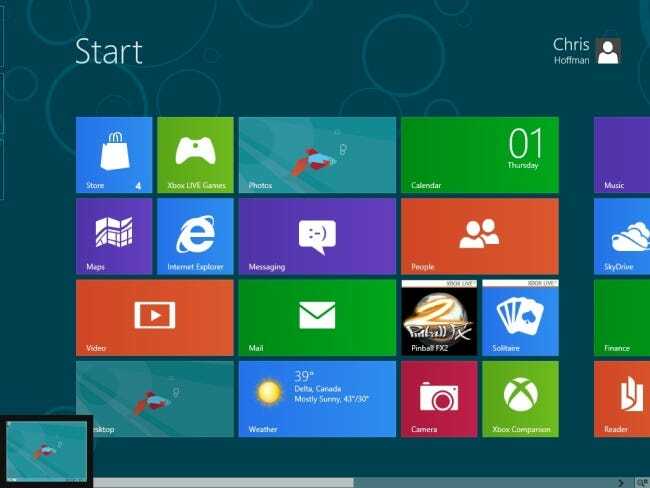 If you’re using Windows 8 on a PC instead of a tablet — like most users — you’ll need to get acquainted with its interface. 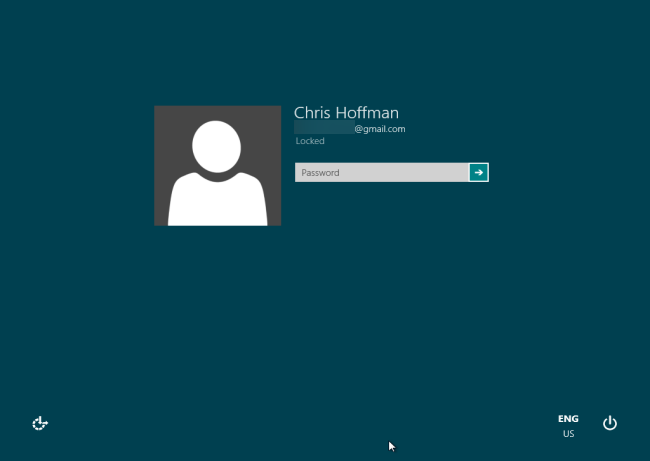 Windows 8’s focus on touch input is obvious from the lock screen. There’s no unlock button to click on the screen. If you were using a touch-screen device, you’d just swipe the lock screen away with your finger. With a mouse, you can drag it away. You can also press a single button on your keyboard or use the scroll wheel, but there’s no indication that this is possible. 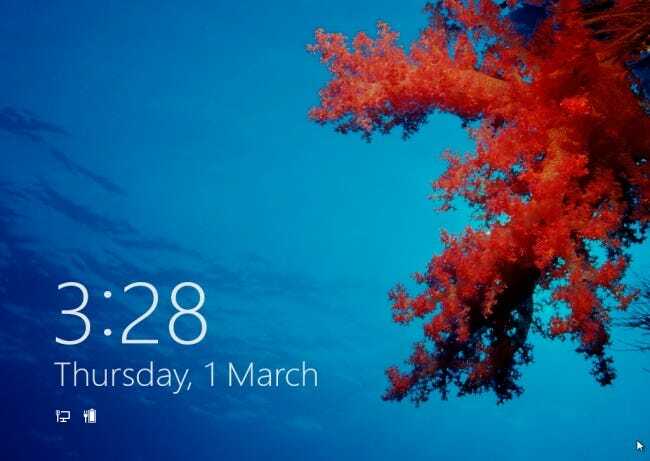 Enter your password to unlock your computer after dragging the lock screen away. 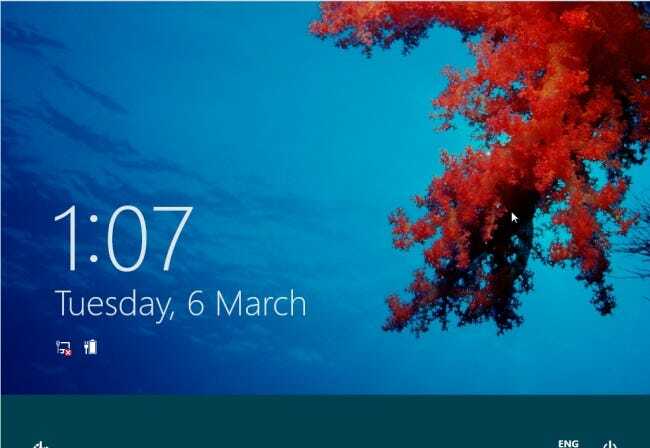 “Hot corners” are one of Windows 8’s most important new navigation features. 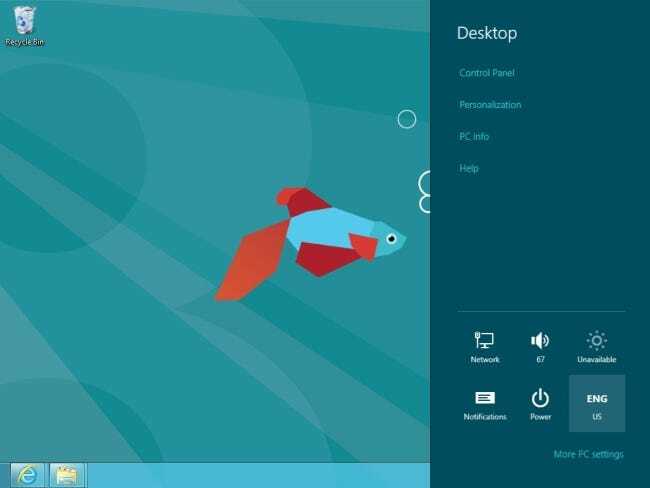 Whether you’re using the desktop or Metro apps, hot corners are your new best friend. At the bottom-left corner of the screen, a hot corner has replaced the Start button. 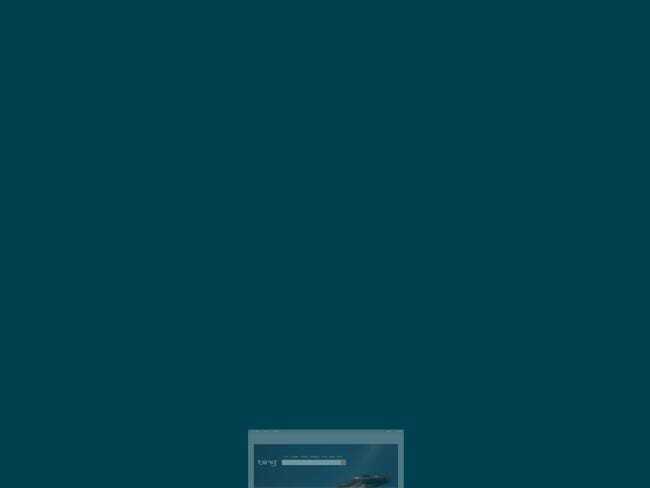 Move your mouse to the corner and click to enter the Start screen. If you’re already at the Start screen, the bottom-left corner functions as a back button that takes you back to the last app you were using. The top-left corner lets you switch between apps. Click once to switch to the last app that you used. If you look carefully, you can see the outline of other apps at the left side of the screen. 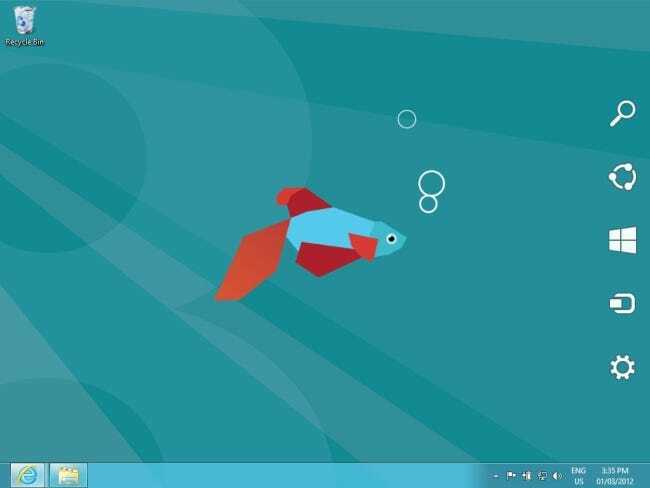 Move your mouse cursor down and you’ll see other recently used apps. Click one to go back to it. Note that the entire traditional desktop appears as a single thumbnail in this task switcher. 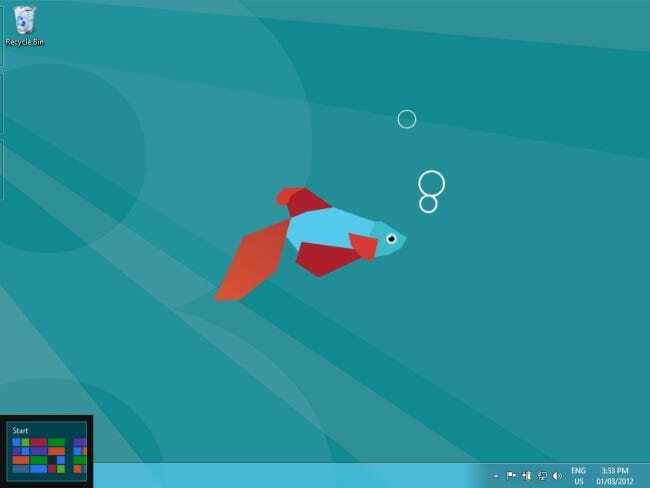 To switch between desktop applications, use Alt-Tab or the desktop taskbar. Move your mouse cursor to either the top-right or bottom-right corners and you’ll see the “charms” fade into view. Move the cursor up or down and the charms will become fully visible. The Start charm accesses the Start screen, while the Search, Share, Devices, and Settings charms access other common functions. For example, from the desktop, you can click the Settings charm to access desktop settings. Charms are context-sensitive. If you click the Settings charm in the Metro version of Internet Explorer, you’ll get Internet Explorer’s settings. Other PC settings always appear on the Settings menu, including the power, network, and volume buttons. Metro-style apps use the majority of the screen real estate for their content. 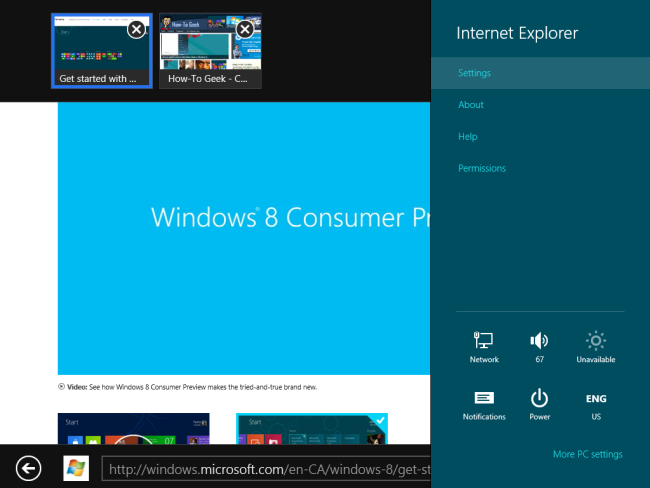 For example, in the Metro version of Internet Explorer, the current Web page takes up the entire screen. There are no toolbars or other interface elements visible. Right-click to view the “app bar” for the current app. For example, in the Metro version of Internet Explorer, you’ll see tab thumbnails at the top of the screen and browser navigation tools at the bottom of the screen. 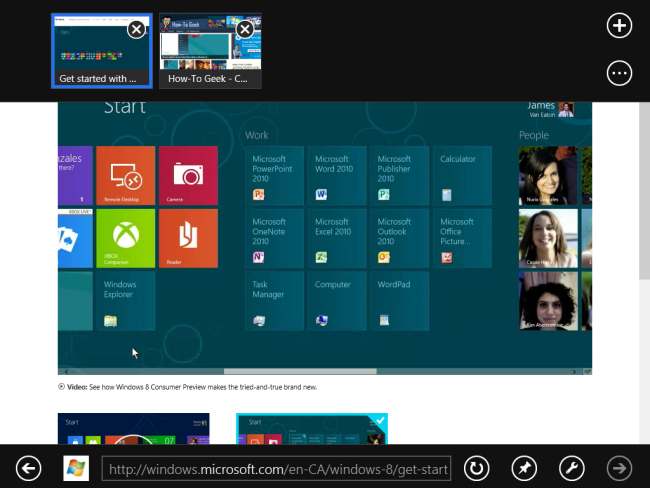 You can have two Metro-style apps on screen at the the same time. The smaller app will have a slimmed-down interface — you can’t have two full apps on screen at the same time. 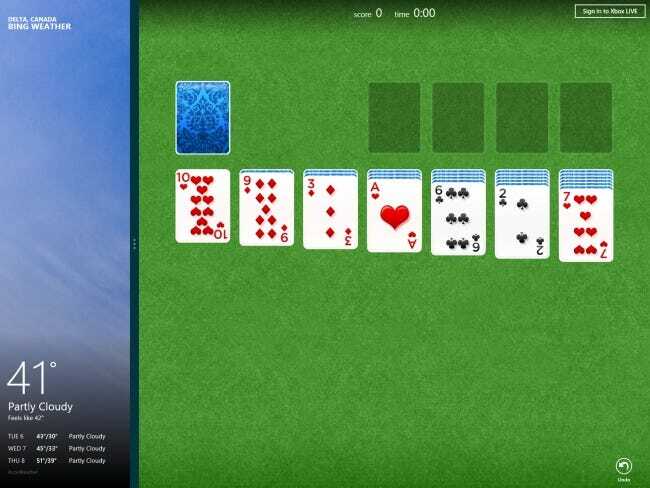 Your screen resolution must be at least 1366 pixels wide to run apps in split-screen mode. Drag and drop a thumbnail from the task switcher to the right or left side of the screen to get started. You can also grab the top of an app and drag it to either side of the screen. Drag the handle to change how much screen space is allocated to each app. 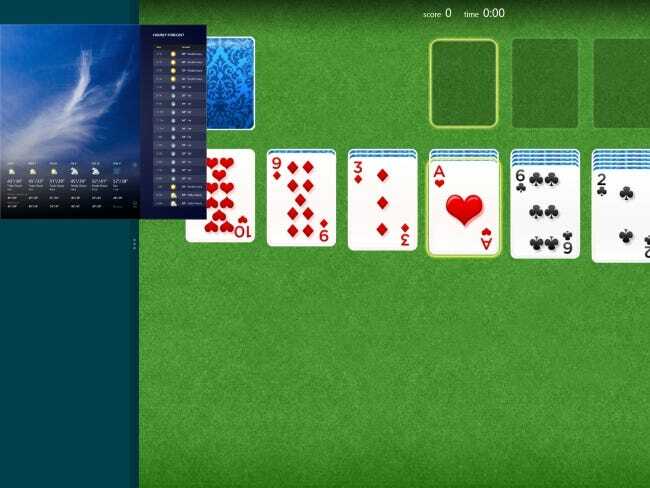 You can allocate all screen space back to a single app by dragging the handle to the left or right side of the screen. 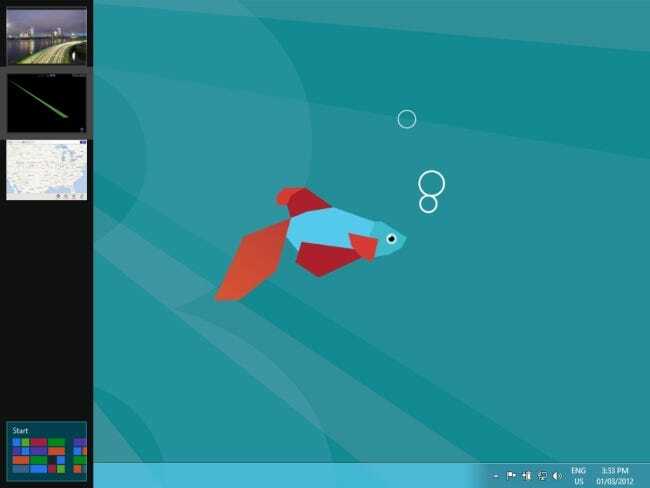 You can even use this method to display a Metro-style app and the traditional desktop at the same time. 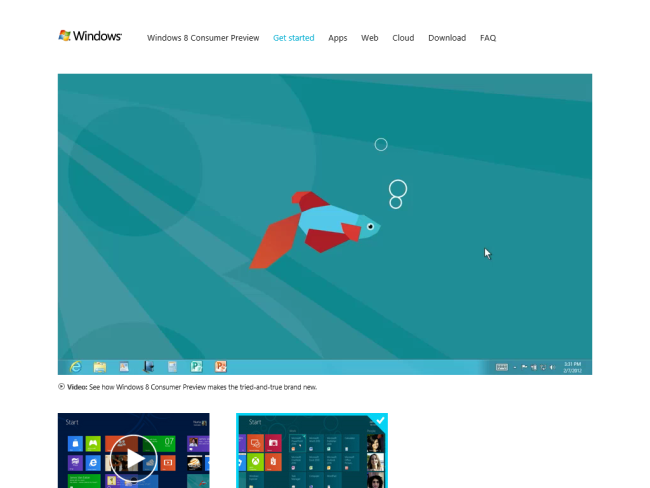 Metro-style apps are different from traditional Windows applications. They’re designed to suspend when you stop using them, so they won’t use up system resources. Because of this, you don’t have to close them. If you want to close one, you can grab its title bar and drag it down. It’ll turn into a thumbnail image of itself. Drag the application to the bottom of the screen and it will shrink, vanish, and close when you drop it. You can also close an app from the task switcher at the left side of the screen. Right-click its thumbnail and select “Close” to close it. 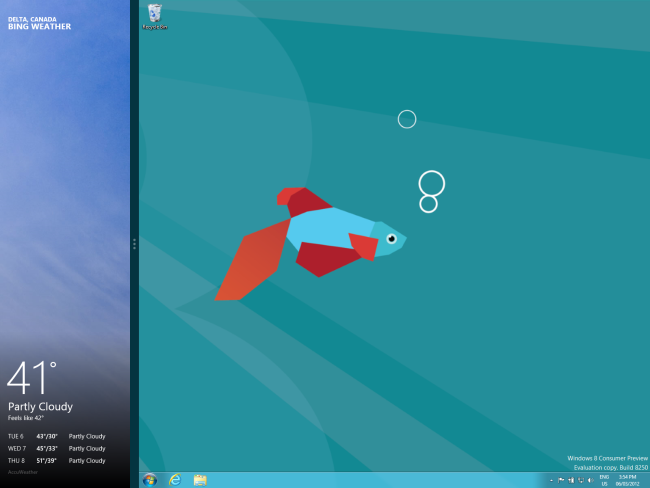 Metro and the Start screen are clearly designed for left-to-right swiping on a touch screen. If you only have a mouse, you can use the scroll bars, like the one you’ll find at the bottom of the screen. A better way is to scroll with your mouse wheel. The mouse wheel should work anywhere there’s a scroll bar. As you’d expect, you can right-click on tiles to perform actions on them or drag them around to rearrange them on the Start screen. On a touch screen, you can pinch to zoom and zoom out of the Start screen. To do this with a mouse, click the small button at the bottom-right corner of the Start screen. 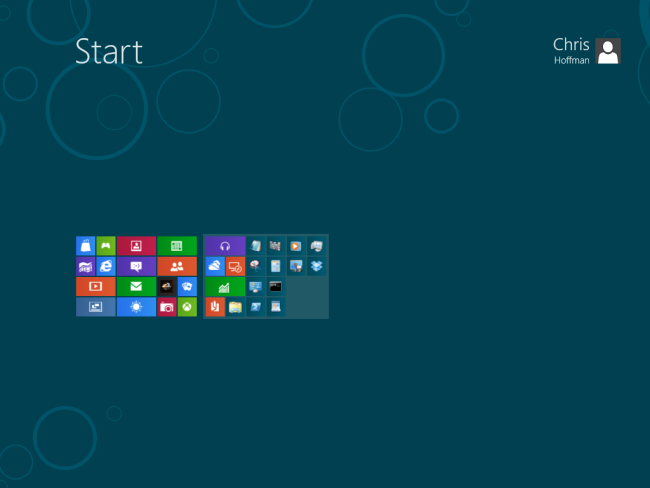 From the zoomed-out screen, you can drag and drop groups of apps around to re-order your Start screen.